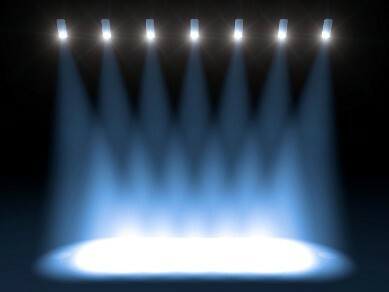 ← IF YOU CANNOT FIND AN EVENT IN THE LIST BELOW, GO TO THE LEGEND ON THE LEFT SIDE OF THIS PAGE AND PUT YOUR CURSOR ON ONE OF THE HEADINGS OF LOUISIANA SITES. THAT MIGHT HELP YOU. EVERYTHING WITHIN THAT HEADING WILL POP UP. THEN CLICK ON YOUR ITEM OF INTEREST. WANT TO ADD SOMETHING, LET US KNOW. 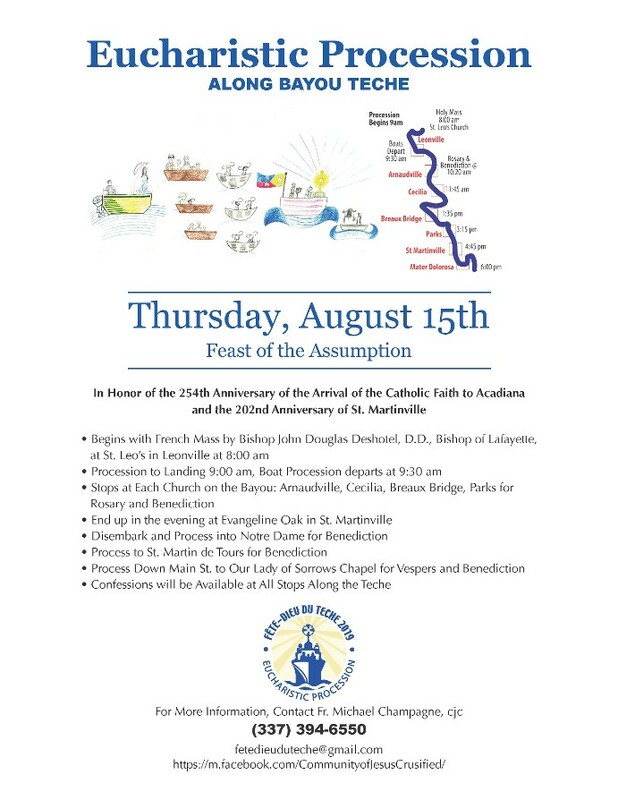 To list a multi-parish Louisiana Catholic event, please send event information or a jpeg image or a pdf document to: macleanland@bellsouth.net to get it listed. That is not to say there are not others. If you know of others, please let us know. 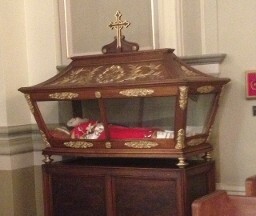 at Our Lady of Prompt Succor Adoration Chapel! 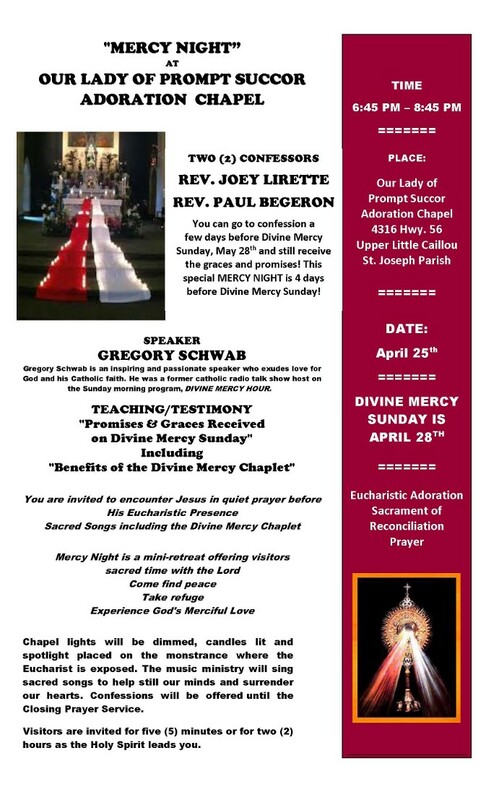 Divine Mercy Sunday is April 28th ... not May 28th ... as announcement wrongly states! 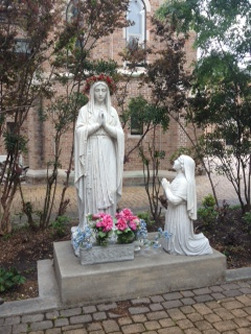 Beginning with Mass: 6:00 p.m.
Immaculate Heart of Mary and, of course, to pray for priests. Cindy Hemelt (883-5783) or Pauline Lee (451-3658). 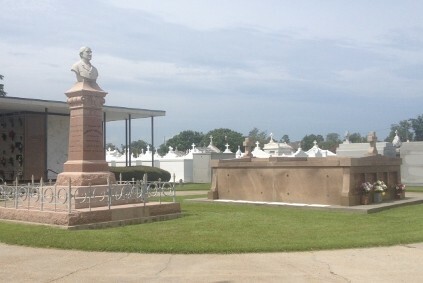 Thibodaux's patronness for protection from fires and hurricanes! Please bring your family and friends. 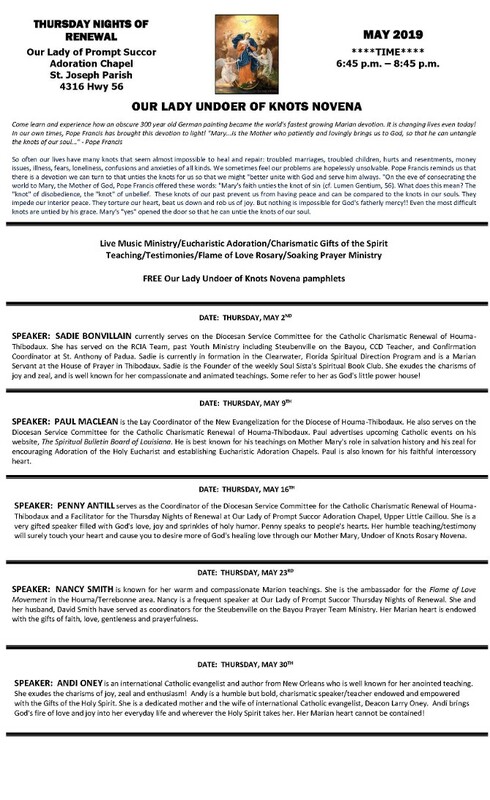 God has been generously putting together another unbelievable line-up of incredible priests and music ministers for the 2019 Holy Spirit Novena. 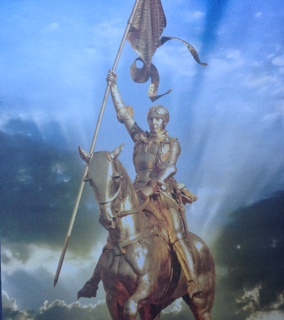 The Novena begins on Friday, May 31, and runs through June 8. Praise and worship along with the Sacrament of Reconciliation will begin at 6:30 p.m. each evening with the Holy Sacrifice of the Mass beginning at 7 p.m. 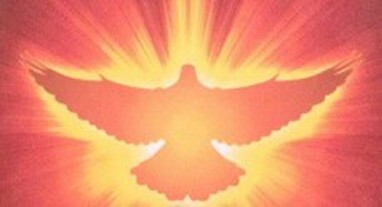 This year’s theme is “Come Holy Spirit, Come”, and God has sent us all that we need to be uplifted, reassured, healed, comforted, and directed by the His Holy Spirit. 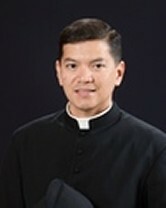 Father Sidney Speaks along with Tongues of Fire will once again open the Novena on Friday, May 31. 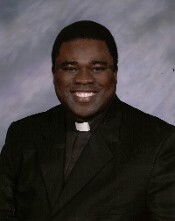 Father Sidney’s testimony, and the praise and worship of Tongues of Fire were amazing at the Novena last year. There will be a coffee shop at the community center following Mass on Friday night. 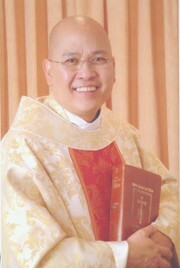 Father Gil Martin, pastor of St. John of the Cross, will be our main celebrant on Saturday, June 1. His homilies the past two years were off the charts. 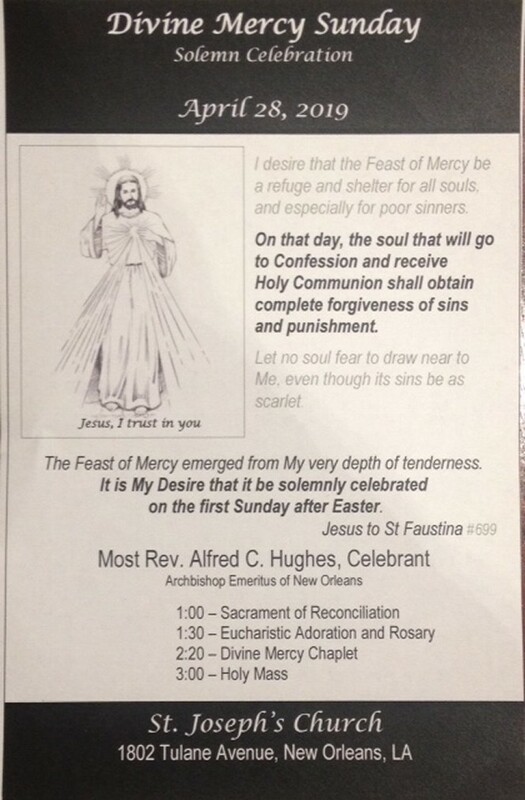 It will be one of the last homilies he will give before retiring at the end of June. Emily and Christian Strickland, a mother and father of two seeking holiness, will lead us in song. 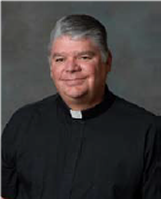 Father Tony Rigoli and the Our Lady of Guadalupe Choir will lead us closer to God and His Holy Spirit on Sunday, June 2. 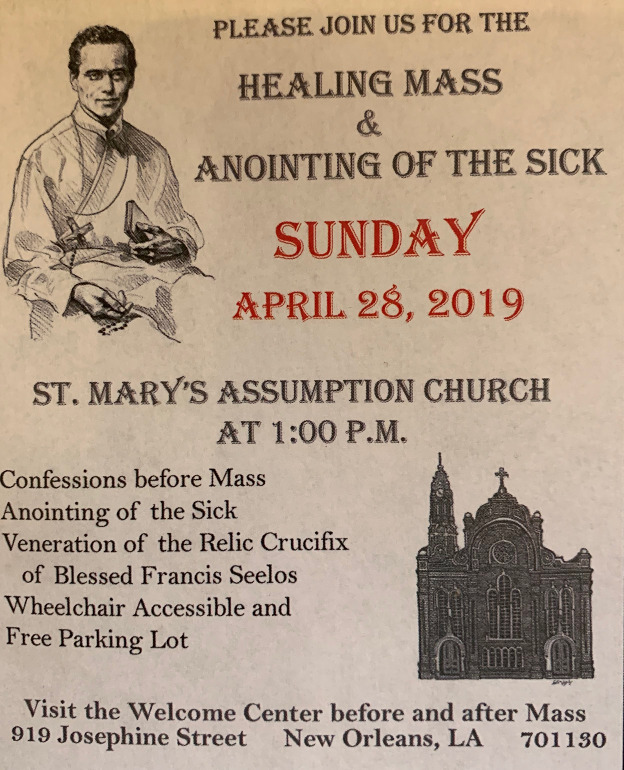 Come experience the joy and comfort that only Father Tony and the Our Lady of Guadalupe Church community can provide in these uncertain times. Archbishop Gregory Aymond will be the main celebrant on Monday, June 3, with the St. John of the Cross Choir leading us in song. This night will be powerful as the archbishop will reassure us that the cleansing and purification of the Catholic Church is being led by the Holy Spirit. And if you heard our choir at last year’s novena, you know they knocked it spiritually out of the ballpark. They have taken it to another spiritual level ever since. 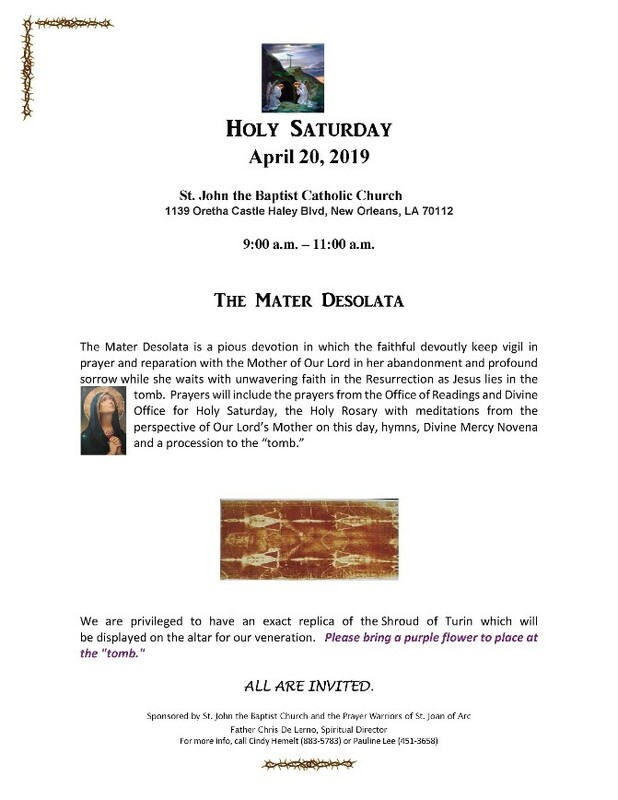 Father Herb Kiff, the pastor of Mater Dolorosa, a real crowd pleaser from two years ago, will be back to tell us the truth about our times. God has paired him with local Christian recording artist, John Finch, who will lead us in praise and worship. There will be a coffee shop following Mass on Tuesday, June 4 aimed at young adults and teenagers. 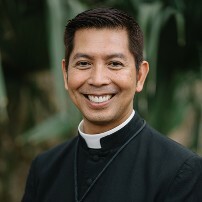 Father Alex Guzman from St. Margaret Mary will be with us on Wednesday. The dynamic Colin MacIver will lead us in praise and worship. 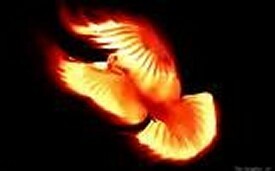 This is yet another powerful spiritual pairing by the Holy Spirit. 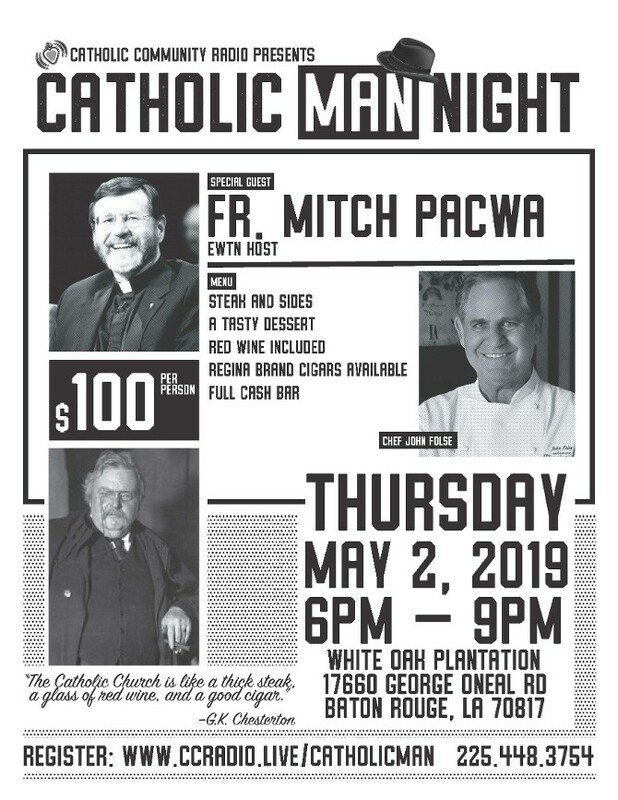 Father Chris Zavachis, who grew up in St. Margaret Mary’s parish, and who is now assigned to Our Lady of the Lake, will be with us on Thursday, June 6. The inspirational Sacred Heart of Jesus Choir will be taking us closer to God through their gift of song. 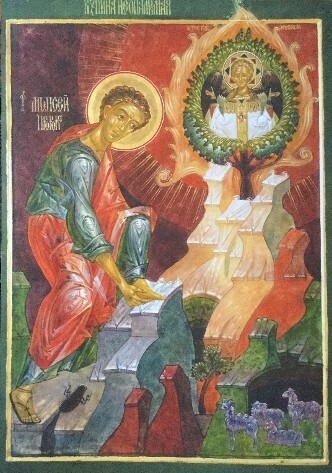 Friday, June 7, will be the healing Mass. 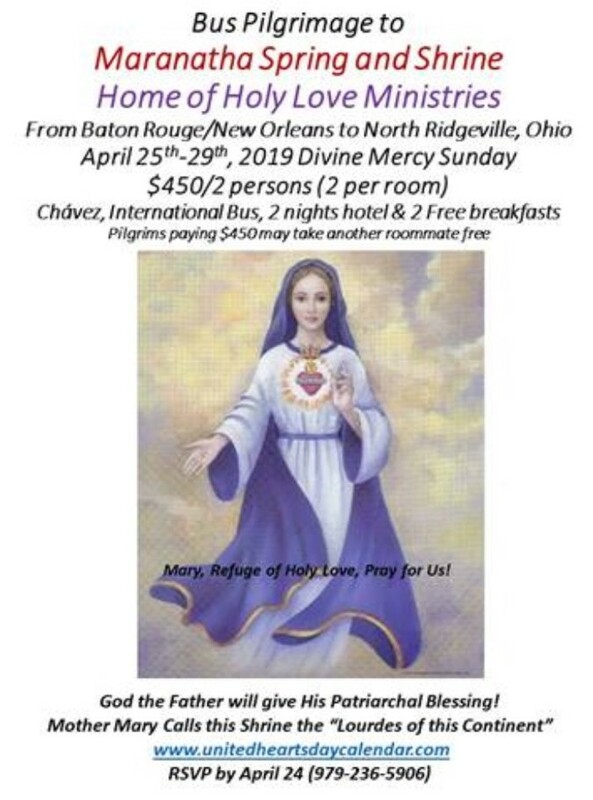 The Holy Spirit contacted Father Robert Joel Cruz, from the Diocese of Houma-Thibodaux and told him he needed to return with his healing team to the Holy Spirit Novena. 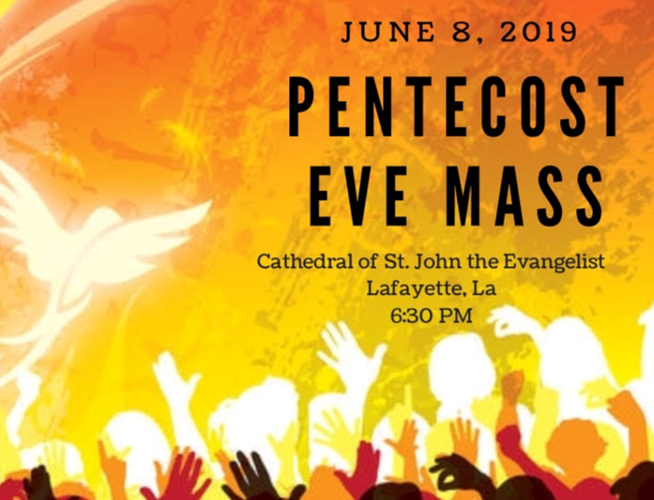 If you were here two years ago, you will remember it was one of the most incredible spiritual nights in the history of St. Tammany Parish. The healing presence of the Holy Spirit was so powerfully amongst us. 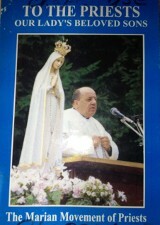 Many miracles happened that night and throughout the Holy Spirit Novena the past two years. So many prayers have been answered, and so much peace has been experienced. 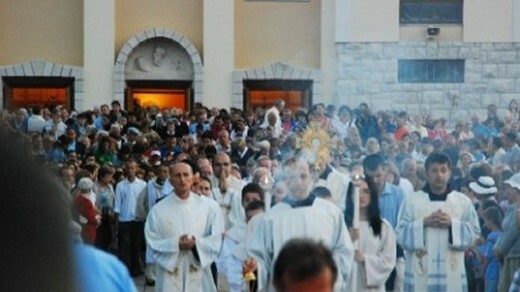 The Novena will conclude on Saturday, June 8. 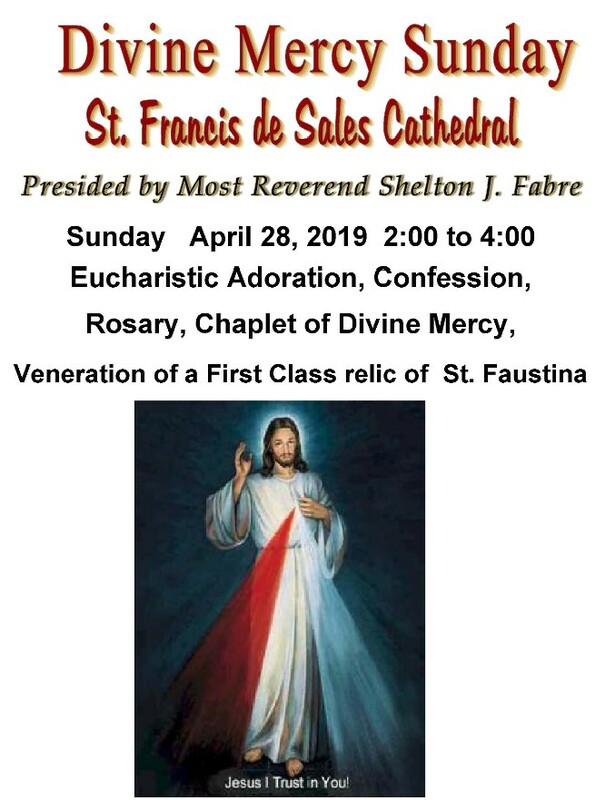 Father Gil Martin will be the main celebrant, and Deacon Ricky Suprean of St. John of the Cross will present God’s homily. Praise and worship on the last two nights has yet to be finalized, but the prospects are outstanding, and rest assured, they will lead us closer to God the Father, and Jesus, His Son, through His Holy Spirit. Save the date! More information will follow concerning details! 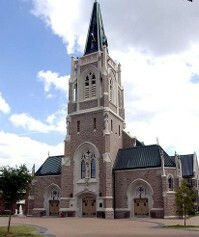 To learn more about St. Kateri, click here. 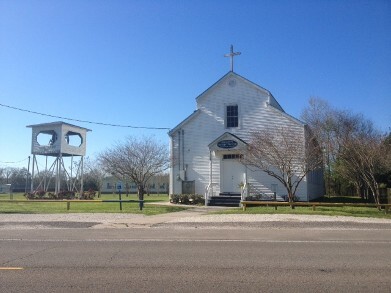 along the bayou where the "Fathers of our Faith" are buried. and we will send you to the right person. Details will be placed here as they develop! 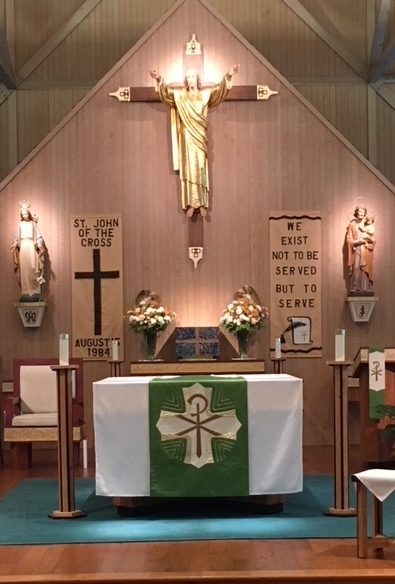 Or click here to visit the CCRHT diocesan website. TO THE 2020 WASHINGTON MARCH FOR LIFE? If you can't got to Washington (and most can't) but you still want to march for life, march through the streets of Louisiana. Spend one Saturday morning and make a public statement for the defenseless that cannot speak for themselves. 2020 Dates will be listed when available. 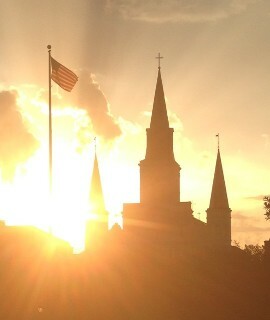 For information of how Louisiana cares for LIFE, click here.